Tutti Bambini CoZee Bedside Crib - Oak and .. The Gro Company - Grobag Nursery Set - 2.5 .. The Gro Company - Grobag Nursery Set 2.5 To.. The Gro Company - Gro-To-Bed - Alfred &.. The Gro Company - Gro-to-bed - All Aboard A.. The Gro Company - Gro-to-bed - Hetty Pop - .. Skip Hop 3pcs Sheet Set - Cot - Springtime .. Skip Hop 3pcs Sheet Set - King Single - Far.. Skip Hop 3pcs Sheet Set - King Single - Jun.. Skip Hop 3pcs Sheet Set - King Single - For..
Made from extra soft, breathable cotton, these fitted sheets are the perfect choice for dressing your CoZee® Bedside Crib. 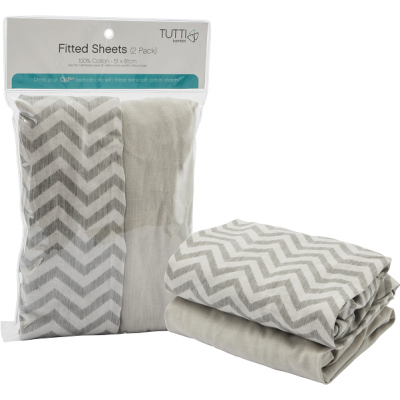 Designed to coordinate with the CoZee® Bedside Crib, this pack includes two fitted sheets in two different designs - plain and chevron. The perfect choice for dressing your little one's crib, these sheets are made from 100% natural, breathable cotton which is kind to young skin offering a comfy nights sleep.